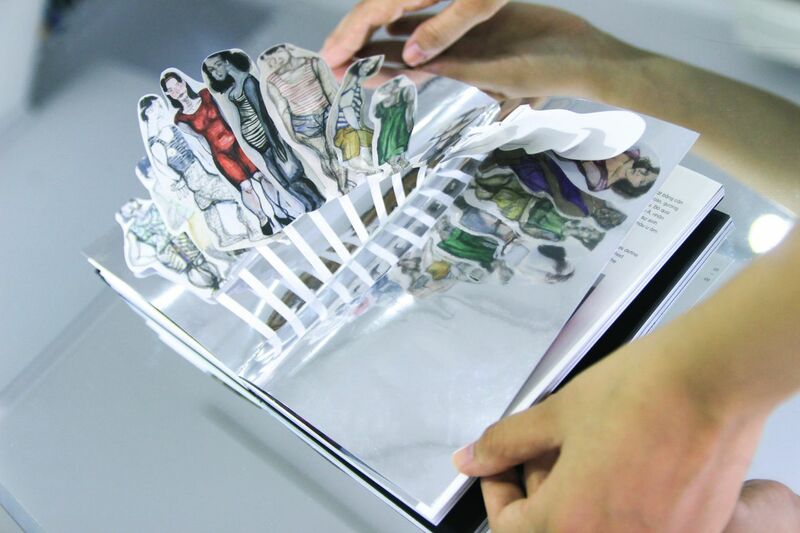 Since 2013, the community-run Saigon Artbook has produced more than 3000 copies of its publication, showcasing numerous Vietnamese artists working in a variety of mediums. 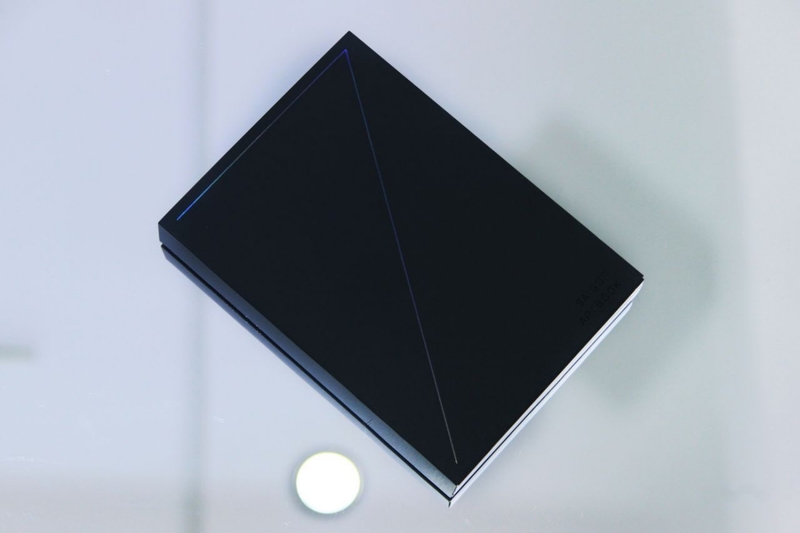 The 7th and latest edition is a truly laudable endeavor in both form and content. 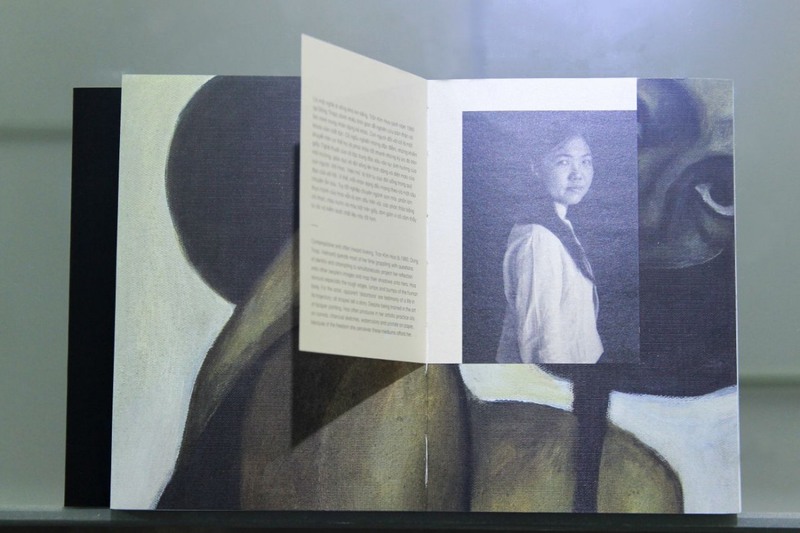 Designer Giang Nguyen has utilized 14 types of paper and experimental printing techniques, pushing the boundaries of what a book can be and how art can be experienced. 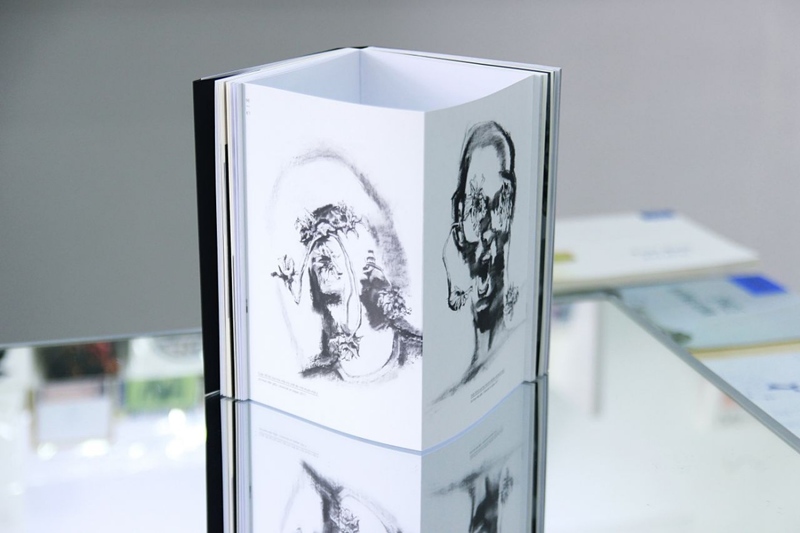 But underneath the compelling visuals, more substantial is how Saigon Artbook reflects the collective force to actively carve spaces for artistic freedom and tackle diverse subject matters in Vietnam today. 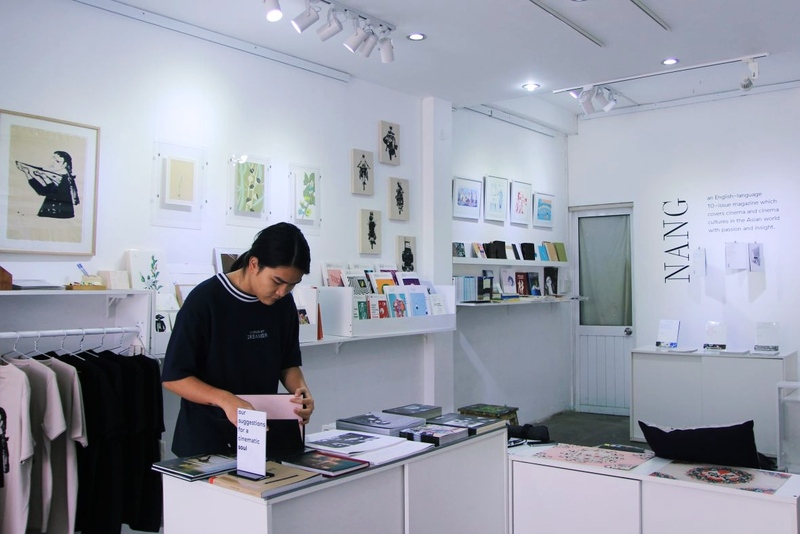 Dang Thanh Long, the co-founder of Saigon Artbook and independent publisher inpages, fervently shares the joy of physically coming into contact with works of art. Combining his love for books and a recognized need to document the evolving contemporary art scene, Long has collaborated with a number of local creators, designers, and curators to bring to fruition this labor of love, titled affectionately after the city they reside. 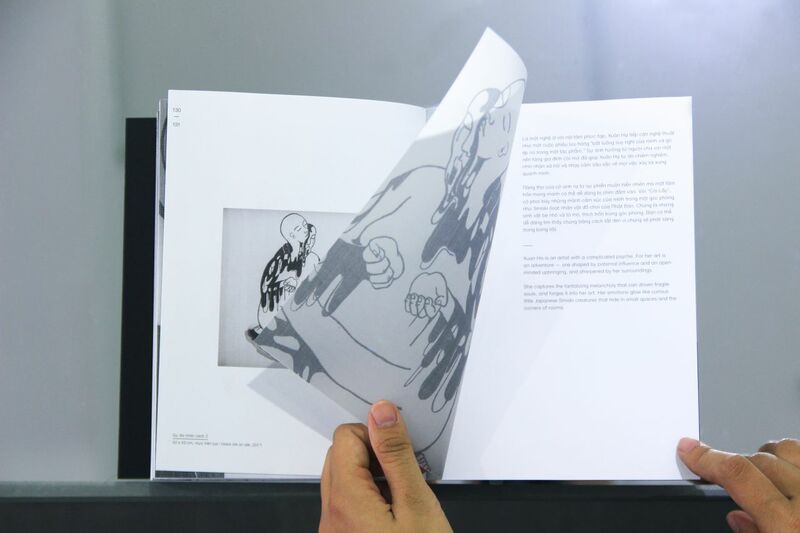 Amidst a world saturated with images and lacking institutional support for contemporary art, lies a rising demand for personally curated and self-published content. 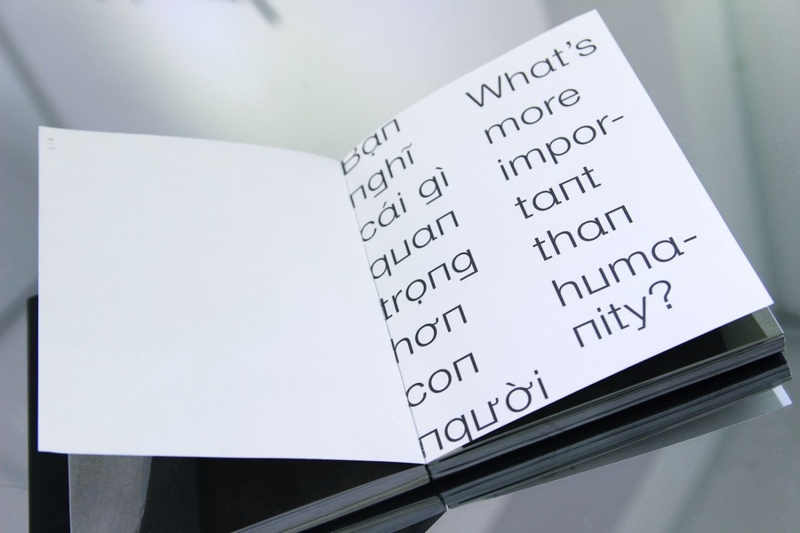 Saigon Artbook is no doubt at the helm of this movement in Vietnam. 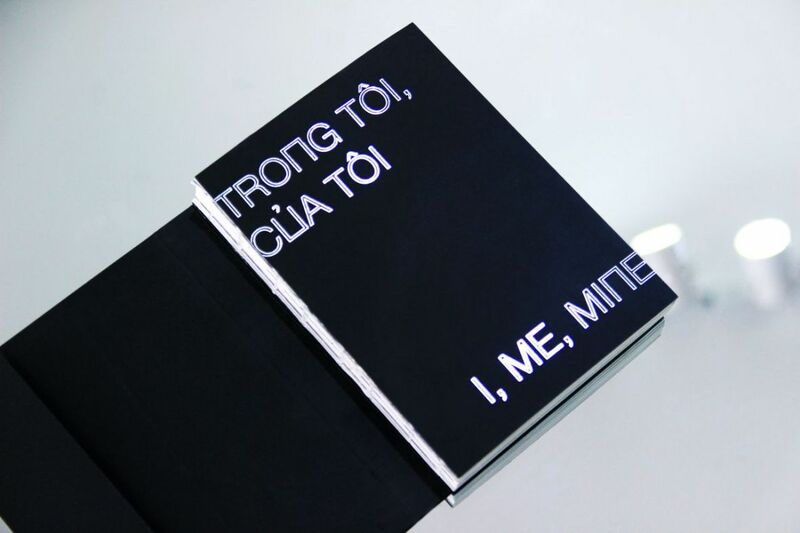 “Young Vietnamese artists now are so much more daring, provocative, almost ‘irritating’ in the way they take on contemporary themes of politics, gender and society,” comments Shyevin S’ng, co-curator of the 7th edition and owner of Vin Gallery. The theme this time of “I, Me, Mine” – despite dealing with introspection – speaks volumes about how the five featured artists think and engage with society. The work of painter Tran Kim Hoa begins with a resounding quote: “What’s more important than humanity?” What follows is a series of female portraits printed on paper stock with a tactile feel that’s close to canvas. The female body has been historically romanticized in visual arts by male creators but this time Tran decides to take matters into her own hands. Through self-portraits painted by staring into a mirror and quick sketches based on memorable women she encountered in real life and local news, Tran attempts to communicate the idea of truly seeing oneself. 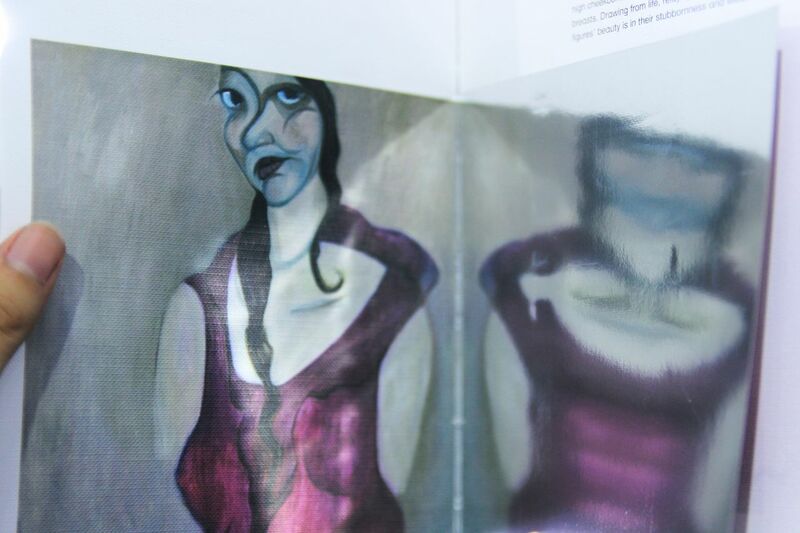 To emphasize this concept, reflective paper intended to resemble a mirror sits alongside her works in the book. Constructed by geometric shapes and bold brushwork, Tran’s women don’t follow any notion of Vietnamese female beauty – lithe, gentle and dreamy. The artist could be reimagining her own figure or fusing it with memories of other women who, similarly, are trapped in an abiding definition of femininity and Asian physiognomy that is said to dictate one’s fate. Rather than shying away, Tran unapologetically celebrates features of womanhood normally deemed undesirable: high cheekbones, perky breasts, large shoulders, love handles, and unruly hair. Yet while looking defiant, these figures are submerged in a dusty hue, implying the harsh living conditions that have left physical marks in their bodies. The series’ title Bonsai – which is defined as “the act of growing ornamental, artificially dwarfed trees” – strikes a sobering note about the invisible containers that mold humans into preconceived ideas. Readers then move to Yatender’s cross-country adventure with her Tinder date in 35mm film. 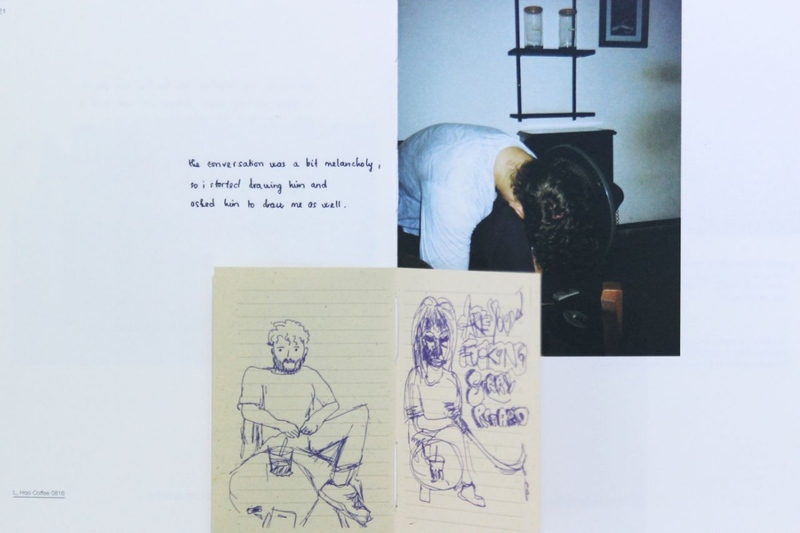 Her visual diary layered with handwritten notes charts a whimsical, bittersweet account of modern dating, toying around with the collision of two people from different parts of the world. She captures her “halfway lover, halfway friend” in private spaces, jotting down her confusion as the relationship advances. 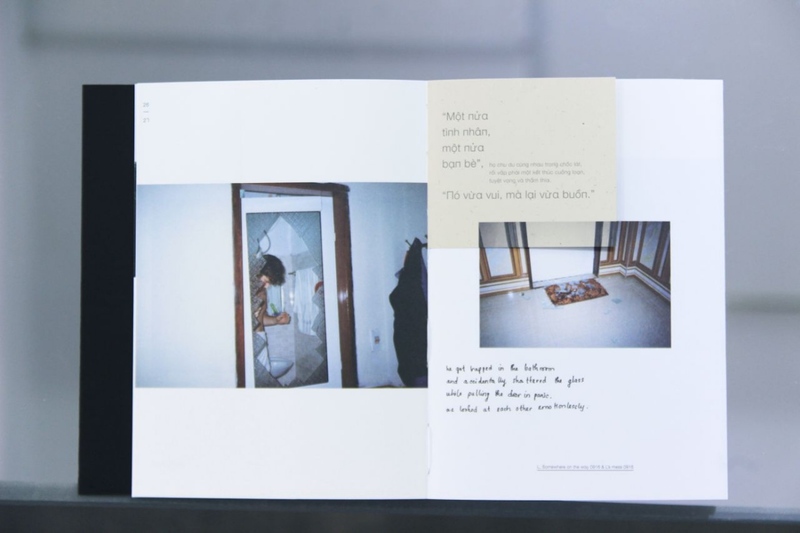 In the only photo where both the photographer and her date appear together, the double-page spread can be opened up like doors to reveal the subject’s naked body, their travel itinerary, and their Tinder profiles. 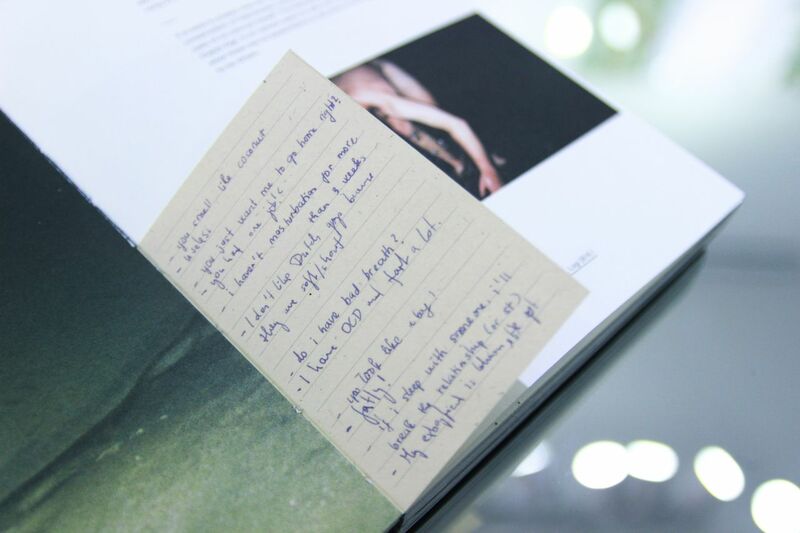 The small-sized images that could only be seen by turning pages serve to create an intimate experience of observing someone elses’ life. Overwhelming is a sense of affection, or more precisely, the yearning for it. Lost in the whirlwind of passion, perhaps Yatender has forgotten that this is supposed to be an experiment. Yatender’s compact camera and 35mm film allows her to shoot without too much intrusion and calculation, and as a result, aesthetics takes a back seat to intuition. “Do you decide to make a memory based on the composition of a face between the sheets?” asks the photographer. 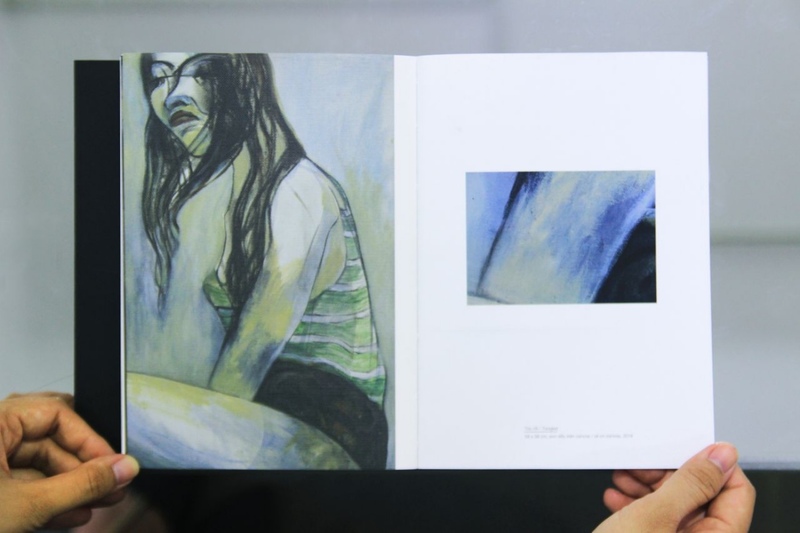 It is easy to consider Yatender’s work as rebellious against the conservatism in Vietnamese culture especially attitudes to women, or generalize it as a response to the online and/or biracial dating trend. However, her work here is a deeply personal one and only wishes to be seen as an effort to “hold onto things that are important to [her] and for people who are lost”. 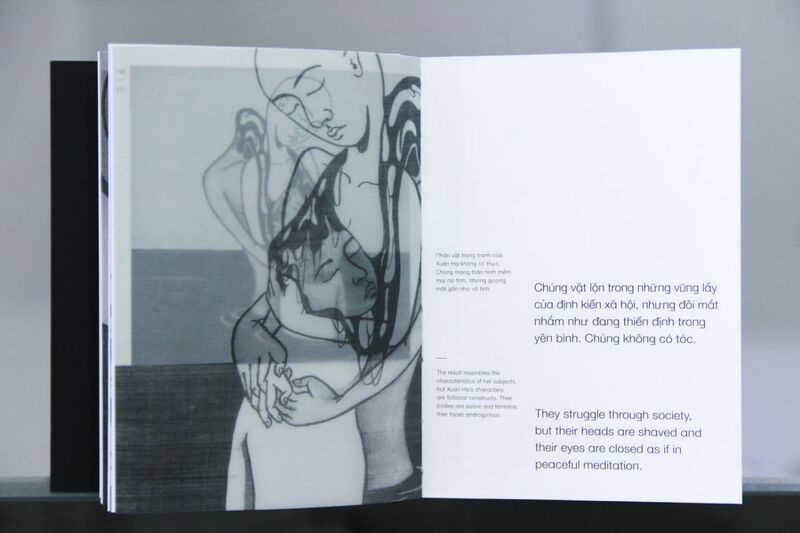 More abstract, yet no less resonant, is the work of Xuan Ha (Grandmadeadxh) where lies otherworldly characters, originally existing in black ink on silk, recreated in the book on opaque tracing paper. Her feminine figures are without hair, sunken in mud with eyes closed as if in a state of deep meditation, contemplating the sorrowful cycle of life and death. 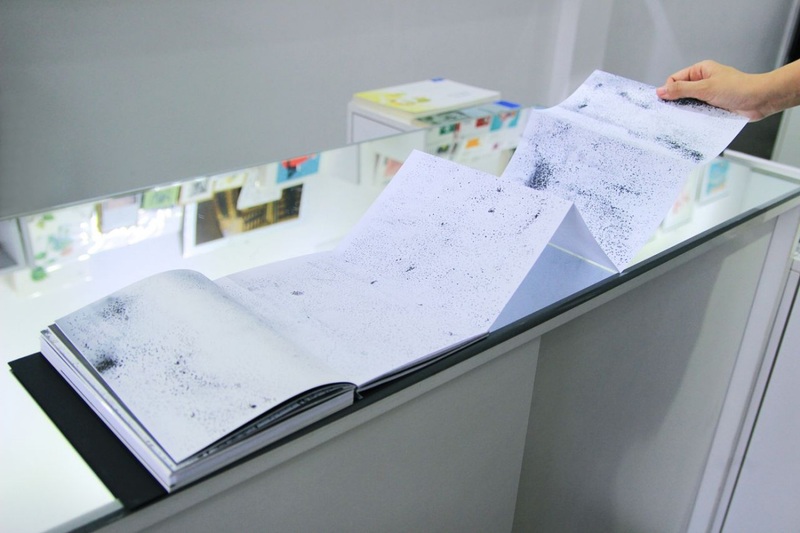 Performance artist Do Nguyen Lap Xuan tackles the idea of greed in her piece Nothingness, the result of hours of diligently dotting and erasing on paper is presented as a six-page spread. Hoang Nam Viet’s charcoal sketches of daily, yet somehow twisted, postures disrupt the sense of normalcy, showing a man shrinking as he consumes food and one’s face obscured by withering sunflowers. 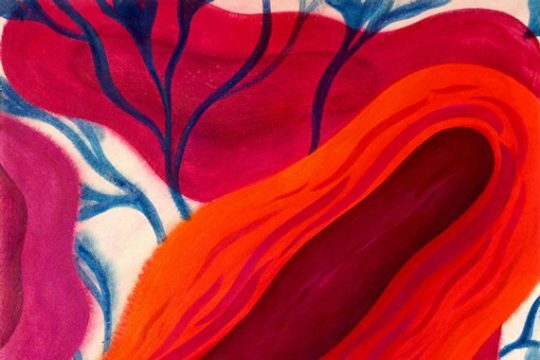 Through personal explorations of five aspiring Vietnamese artists, we see various interpretations of the theme of self and its shifting place in different environments. 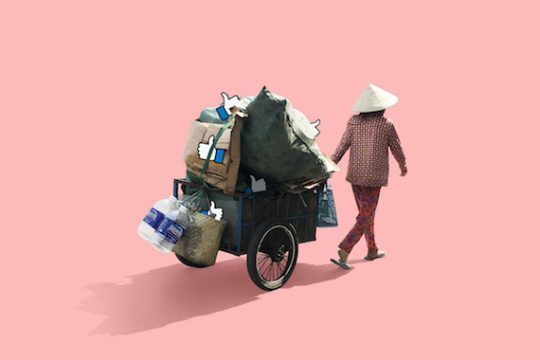 While none of these artists might want to represent Vietnamese youth as a whole, their creative effort does shed light on what it’s like to live in modern-day Vietnam as a young person. 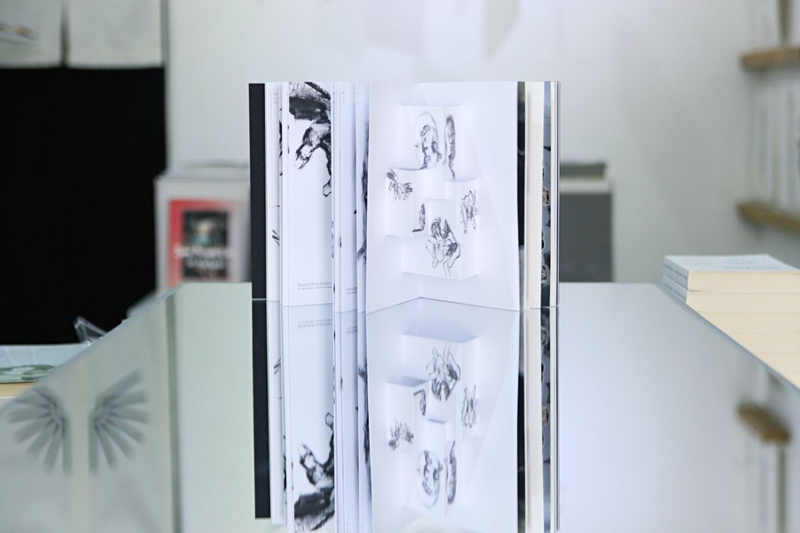 The 7th edition of Saigon Artbook continues the commitment to publishing by utilizing printing materials to great effect. 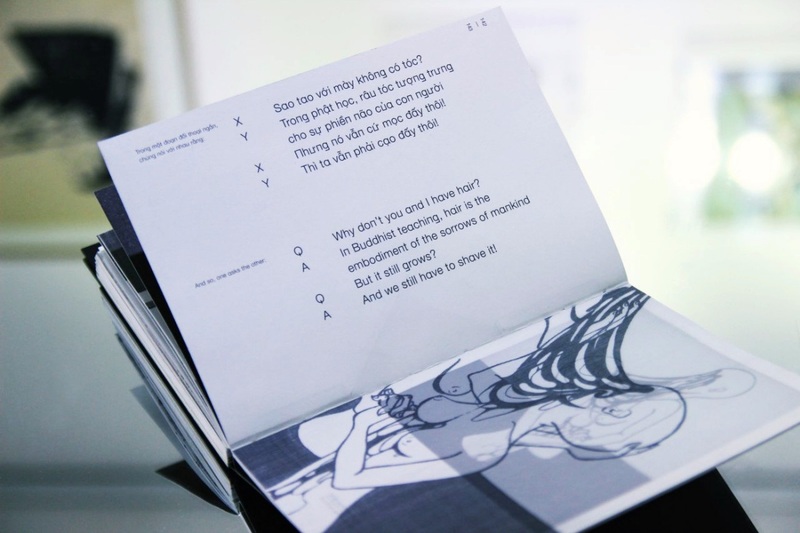 Step by step, one page after another, Saigon Artbook pushes the burgeoning art scene forward while documenting it at the same time.